cylinders, from worn valves, or from faulty conditions in the pipe connections external to the pump. When a body, or a liquid, is made to revolve or whirl around a point, a force is created that impels the body or fluid to move outward from the center of rotation. This phenomenon is called CENTRIFUGAL FORCE. It is from this force that the centrifugal pump got its name. The basic centrifugal pump has only one moving part-a wheel or impeller that is connected to the drive shaft of a prime mover and rotates within the pump casing. The design, or form, of the impeller varies somewhat. 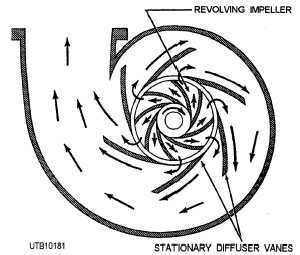 However, whatever its form, the impeller is designed to impart a whirling or revolving motion to the liquid in the pump. When the impeller rotates at relatively high speeds, sufficient centrifugal force is developed to throw the liquid outward and away from the center of rotation. Thus the liquid is sucked in at the center or eye of the impeller (center of rotation) and discharged at the outer rim of the impeller. Note that by the time the liquid leaves the impeller, it has acquired considerable velocity. In this connection, a fundamental law of liquid physics states, in part, that as the velocity of a fluid increases, the pressure or pressure head of that fluid decreases. Therefore, the liquid discharge from the impeller has a high velocity but low pressure. Before the liquid can be discharged from the pump, an INCREASE in pressure is necessary. In other words, the primary concern in practically all pumping systems is to maintain the discharge pressure so liquid can be distributed effectively throughout the system. In centrifugal pumps, a device is required to decrease the velocity of the impeller discharge and thereby increase the liquid pressure at the discharge outlet. One method of increasing the discharge pressure of centrifugal pumps is by providing additional impellers. Pumps with only one impeller are SINGLE STAGE. Pumps with two or more impellers are MULTISTAGE. In multistage pumps, two or more impellers are placed on a common shaft (within the same pump housing) with the discharge of the first impeller being led into the suction of the next impeller, and so on. As the liquid passes from one stage to the next, additional pressure is imparted to it. In this fashion, the final discharge pressure of the pump can be increased considerably. TYPES OF CENTRIFUGAL PUMPS. - Centrifugal pumps are also HORIZONTAL or VERTICAL, depending upon the position of the pump shaft. Generally, large, multistage, high-capacity pumps are horizontal. Most other pumps are vertical. The impellers used on centrifugal pumps may be SINGLE SUCTION or DOUBLE SUCTION. The single-suction impeller allows liquid to enter the eye from one direction only; the double-suction type allows liquid to enter the eye from two directions. Impellers are CLOSED or OPEN. Closed impellers have sidewalls extending from the eye to the outer edge of the vane tips; open impellers do not have these sidewalls. Most centrifugal pumps in the Navy have closed impellers. In the VOLUTE type of centrifugal pump shown in figure 6-15, the impeller discharges into a volute or gradually widening channel in the pump casing. As the liquid passes into the expanding neck of the volute, its velocity is considerably diminished; and, with this decrease in velocity, the pressure increases. Figure 6-15. - Volute pump. Figure 6-16. - Diffuser-type centrifugal pump.